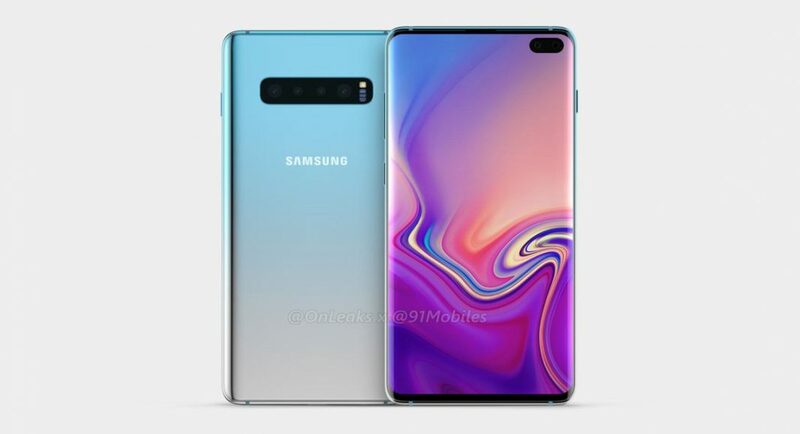 As we are coming closer to the launch of Samsung Galaxy S10 and Galaxy S10 Plus smartphones, more and more news about them is surfacing online. It has even been reported that Samsung is planning to launch four instead of the usual two devices in its lineup this year – a Lite version and a 5G model. And now, 91mobiles in partnership with @OnLeaks has shared the renders of the much anticipated Samsung smartphone. 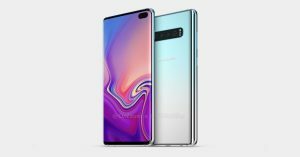 A 360-degree video of the Samsung Galaxy S10 Plus has also been shared and the report by 91mobiles also carries some details about the smartphone which it claims are confirmed. According to the report, Samsung Galaxy S10 Plus will sport a 6.4-inch dual-curved edge display, and we should mention that this is line with previous leaks of the smartphone. The screen of the smartphone is expected to come with an AMOLED panel and will have QHD resolution. The renders that have been shared show that Samsung Galaxy S10 Plus mobile sports four rear cameras coupled with an LED flash. These cameras are horizontally stacked on the device and reportedly comprise of a standard, a telephoto and a wide-angle lens. The details about the fourth camera have not been shared yet. The front panel of Samsung Galaxy S10 Plus has dual selfie cameras that are placed on the top right corner of the display. In the renders, it looks like they are piercing into the display. At its Developer Conference last month, Samsung has showcased this selfie camera placement and had called it the ‘Infinity O’ design. With this kind of placement of cameras, we can expect the Samsung Galaxy S10 Plus to give us a nearly bezel-less display experience and come with one among the highest screen-to-body ratios. The dimensions of the smartphone are reported to be 157.5 x 75.0 x 7.8mm. 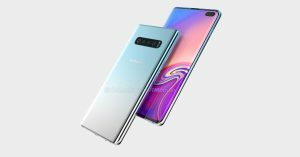 The renders show the smartphone to be available in gradient Ice Blue, which the company also used for Samsung Galaxy S9 and Galaxy S9 Plus. 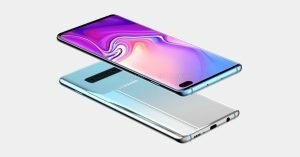 Earlier reports have also confirmed that Samsung Galaxy S10 Plus will come with an ultrasonic in-display smartphone and will be dedicating 30% of its screen to it. So you can place your finger anywhere on that portion of the display and the smartphone will be unlocked. It is also worth noticing that an ultrasonic fingerprint sensor uses sound to read the map of your fingerprint and is more accurate than optical fingerprint scanners used in the likes of Vivo Nex (review) and OnePlus 6T (review). Prior reports have also suggested that Samsung plans to ditch iris scanning and will come with face unlock instead. Samsung Galaxy S10 Plus has been reported to retain a 3.5mm jack and it will be placed along with the USB Type-C port at the bottom. The SIM card will be placed on the top, much like Samsung Galaxy A9 (2018). The power, volume rocker and Bixby buttons would be placed on the side edges of the smartphone. Other specifications of the upcoming smartphone include Qualcomm Snapdragon 855 processor or Exynos 9820 SoC, depending on the market. It should run Android Pie skinned with Samsung’s OneUI and as of now, there is no clarity on the RAM and storage of the device. A report did say that a 12GB RAM and 1TB storage model is in the pipeline, but if this is true, the price tag would be massive too.